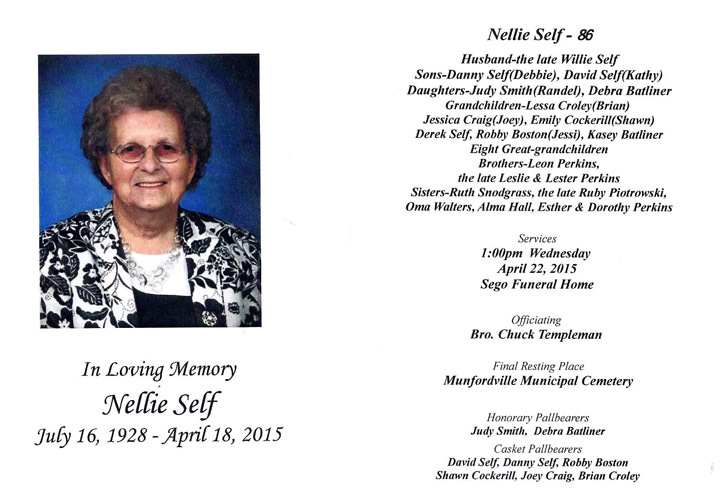 Nellie Self, 86 of Munfordville passed away Saturday, April 18 in Simpsonville. She was a daughter of the late Thad & Lillie Reynolds Perkins and the wife of the late Willie Self. Mrs. Self was a member of the Wilkerson Temple Methodist Church. Funeral services for Nellie Self will be 1pm Wednesday, April 22 in the chapel of Sego Funeral Home with Bro. Chuck Templeman officiating. Burial in the Munfordville Municipal Cemetery. Visitation will be Monday from 5:30-9pm, Tuesday from 9am-9pm and Wednesday after 9am at the Sego Funeral Home.